Abu Dhabi oil show is one of the most important oil industry issues in GCC countries. Nearly 3000 companies will come for the oil show. And many visitors come from worldwide. 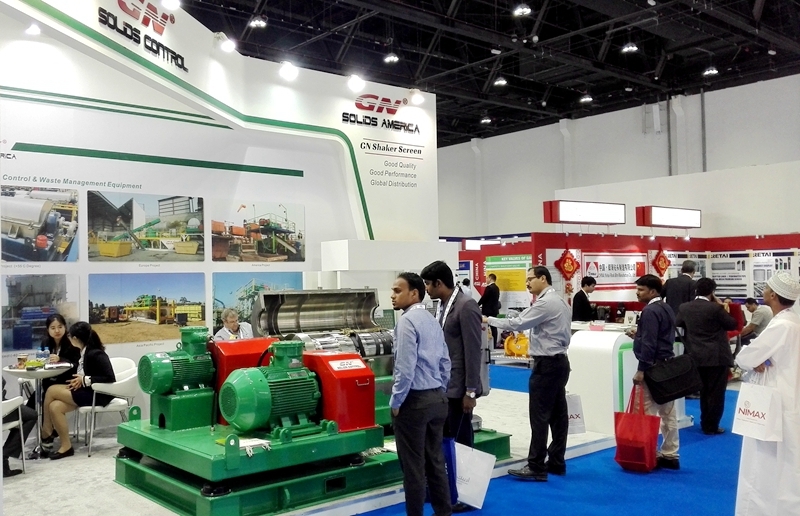 GN Solids Control started to come for Abu Dhabi oil show since 2013. Every year, GN will meet with old friends and know new friends there on the big events. As most of GN old friends can see, GN keeps improving himself. Every year, GN takes surprise to GN friends. They experienced the developments of GN. In 2016 ADIPEC, GN takes its popular size 14 inch decanter centrifuge for the oil show. It is the most popular size for mud solids control, drilling waste management, oily sludge separation, waste water treatment, dewatering system, and other fine solid remove applications. Many clients showed great interest on GN decanter centrifuge, and have interest for more information. If you did not take GN brochure on the show, you can visit GN website to download, or contact with GN group to ask for information. Besides the 14 inch waste management decanter centrifuge, GN Solids Control showed its high quality replacement screen. GN Solids Control makes high quality replacement screen for different models of shaker. For more details of GN screen, or want sample for test, welcome you contact with GN sales teams. Below is the contact of GN group. Welcome you contact GN with the nearby branch to you for fast response. • GN China Company: HeBei GN Solids Control Co.Ltd.